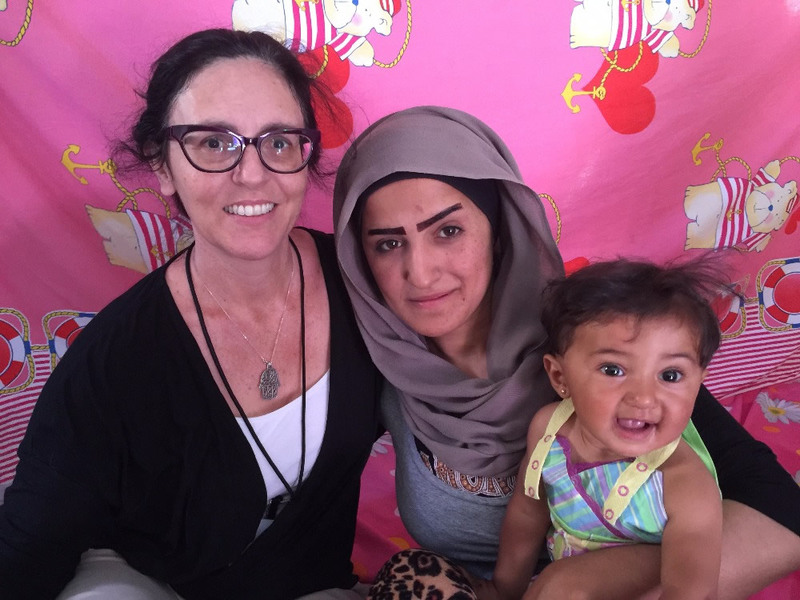 Jackie Menter, left, on the island of Chios in Greece last July, where she brought aid to Syrian refugees. More than a year ago, news about the hundreds of refugees fleeing war-torn Syria for the uncertain shores of Greece sparked San Clemente resident Jackie Menter to take action. “Something called me to help first-hand,” said Menter, who had spent 18 months in Greece volunteering on the island of Chios. This Sunday, Menter’s ambition takes shape in a Laguna Beach benefit concert set for Sunday, Dec. 3, at the Neighborhood Congregational Church. Concert-goers will also hear a first-hand account of current conditions in Syria from a refugee, whose safety was threatened for aiding injured civilians. Menter is also the social justice chair of the Jewish Collaborative of Orange County, which participated in a March fundraiser with the Multifaith Alliance for Syrian Refugees that raised $30,000. Fellow musicians in the Marbella Trio urged her to organize a follow-up event. Violinist Nancy Davis and pianist Ann Bunker accompany Menter, a cellist in the chamber music group. All three are music teachers. The Multifaith Alliance was started in 2013, three years after the onset of the now seven-year civil war in Syria. The collaboration includes 90 faith-based organizations including Buddhist, Christian, Hindu, Jewish, Muslim and Sikh that aid Syrians displaced by the seven-year civil war. After two years of back-channel efforts, they have established partnerships between organizations providing services in Israel and Syria. The partnership allows a new distribution route for aid through ports in Israel, including an army base in the Golan Heights on the southern border of Syria. From there, medical supplies, clothing, food, household items and even ambulances can reach an area of conflict inhabited by 1.5 millon people, an alliance statement says. Politics aren’t on the concert program. It will feature excerpts of works by classical composers and will conclude with a more contemporary work by Russian composer Dmitri Shostakovich. “We selected the Shostakovich as the centerpiece work for the performance because of its political and humanitarian perspective. Shostakovich composed the work in 1944 when news of the Holocaust had just become public knowledge in Russia. The music uses Jewish folk themes and motifs reminiscent of war, marching soldiers, genocide and profound loss. With what is happening in Syria today, the Shostakovich piece is a timeless testament to oppressed victims anywhere,” Menter said. After the concert, Shadi Martini will talk about his 2012 escape from Syria after the former hospital manager was discovered to be covertly providing aid to wounded and ill civilians in Aleppo. He now is director of humanitarian relief and regional relations for the alliance and will update the audience on current conditions inside the country. The Jewish Collaborative connected Menter with the Interfaith Council of Laguna Beach and Pastor Rod Echols of the Neighborhood Congregational Church who agreed to co-sponsor the concert. “Their show of support has been extraordinary,” Menter said. A reception will follow the 2 p.m. concert. It is preceded at the church, 340 St. Ann’s Dr., by a holiday boutique, which offers shoppers fair-trade made crafts and jewelry by artisans from other countries and additional gifts that support social justice. The alliance aims to attract donors to its fund-a-container campaign, which is starting with New York Catholic Archdiocese, said Marlene Adler, an alliance spokeswoman. Those in attendance at Sunday’s concert or other groups can sponsor a shipping container of humanitarian aid for $5,500. On the MFA’s tracking webpage, donors can follow their container’s progress, from its packing to its ocean voyage to the Syrian border, the MFA website says. Once in Syria trusted relief agencies on the ground disburse the supplies to villages, clinics and field hospitals, which are sometimes set up in caves to avoid government detection. To date, the alliance says it has delivered $65 million in humanitarian aid to Syria. Future plans include creating grade school curriculum on tablets for Syrian children, producing a balanced TV news series for Arabic outlets and setting up a bakery to feed the local population and provide jobs.